Our first stop is the old Royal Palace built in the 1860’s. It is a huge square compound, surrounded on all four sides by a wall and a moat The wall is two kilometres long on each of the four sides. The entire place was bombed in the war, and virtually destroyed. 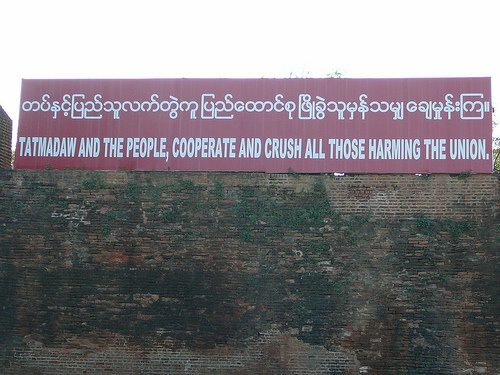 The government, recognizing a tourist attraction when they see one, decided to rebuild it in the 1990’s. However, where there were once huge wooden columns there are now huge cement columns, and where there was gold leaf covering everything there is now gold paint. It all looks so tacky, and very few people go there. To make matters worse the huge grounds that were so beautiful, are now full of unsightly cheap housing used solely to house army soldiers. Min, our guide, is making her opening political statement by taking us here first. However a block or so away is one of the original buildings. It is in this building that the King died, and his son wanted to preserve it as a special and separate monument, so moved it away from the palace, thus unwittingly insuring its survival during the bombings. 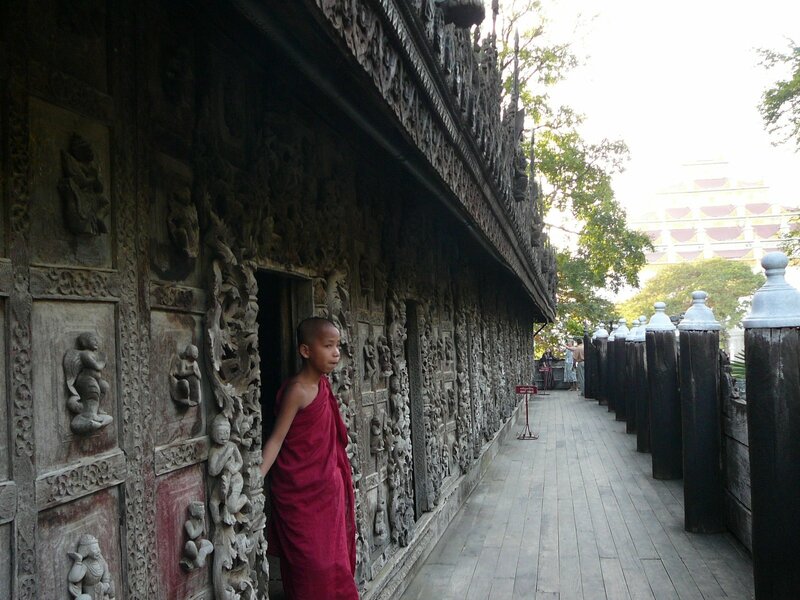 It is one of the most beautiful buildings I have ever seen, built entirely of teak and covered in intricate carvings. 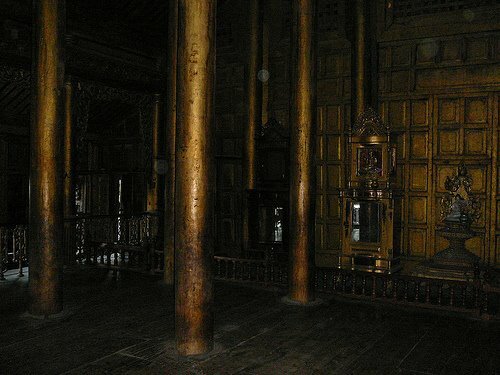 Both inside and out were originally covered in gold, but very little remains on the outside because of the weather. But the inside still gleams, the many tall golden pillars supporting the roof look like a shining forest, It is an amazing sight, that dazzles the eye. From here we go to lunch in a local restaurant where we have to listen to a CD of Christmas Carols sung in English by a Burmese singer who obviously learned parrot fashion from listening to the original, and has no idea what he is saying. We recognize the song “I saw Mommy Kissing Santa Claus”, but instead of singing “If Daddy had only seen” He sang” If Veddy Veddy on the scene”, and “He thought that I was tucked up in my bedroom fast asleep” became “he thawed a ice water up in my bedroom vast and leap”. 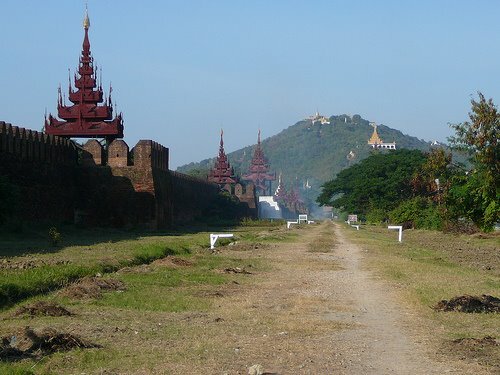 This entry was posted in Burma, Mandalay, Myanmar, Royal Palace, travel, travel guide, travel review, travelogue. Bookmark the permalink.